Successfully Added USB C Hub - Highspeed Data Transfer, 3x USB 3.0, 1x USB C, 1x SD Card Slot, 1x Micro SD Card Slot to your Shopping Cart. If you are having difficulties to synchronize your older electronics with your newly acquired USB-C smartphone or tablet PC, this high-speed 5-in-1 USB 3.0 to USB type C hub is the perfect accessory for you. Coming with a USB-C out, an SD-Card slot, Micro SD-card slot, and three USB 3.0 ports – this multifunctional USB hub is guaranteed to bring along plenty of possibilities for you to connect and sync all your electronic devices. 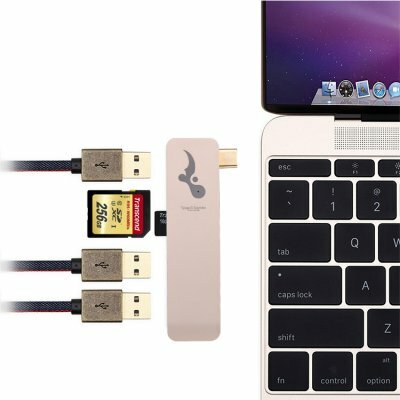 All you have to do is insert the USB hub into your smartphone, slide in the USB 3.0 cable of your older electronics, and you’re all set to transfer files in between your different electronics at lightning speeds. Whether you’re using an Apple MacBook, Galaxy TabPro-S, or any other new tablet PC or laptop – this USB C hub is the ultimate electronic gadget. Featuring a compact, lightweight, and durable design – this USB C to USB 3.0 hub can be easily carried along within your bag or pocket. Data transfer speeds up to 108M/s offer you a quick and efficient method to transfer files in between your different electronics without ever again experiencing any lag. With its multifunctional design it furthermore allows you to slide in an SD card and Micro SD card – truly offering great and easy ways for you to share files between any types of electronic device. This USB C Hub comes with a 12 months warranty, brought to you by the leader in electronic devices as well as wholesale electronic gadgets.. I like it, and it is not expensive. I've already bought it, it works really well.